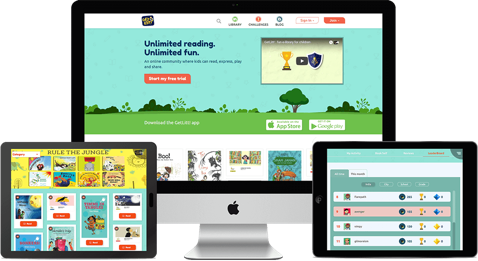 Monthly Online Book Subscription App for Kids | GetLitt! 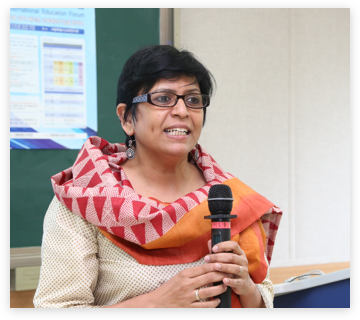 Professor and Dean, School of Education,Tata Institute of Social Sciences (TISS), Mumbai. Reading as an activity has always been privileged over other activities, However, the need to engage with the printed word both on paper or on screen in today's world where technology-providing cheap entertainment, has invaded our lives, is being felt all the more. Stories either oral or written have a unique importance and there is sufficient literature which celebrates the significance of stories in our lives. Getlitt -an online library portal offered by The Writers Bug is one such engaging, interactive and sensitively curated platform created especially for children across social diversities. It is designed in such a way that it guides and facilitates a child's search for books and provides spaces for children to weave in their own experiences with the rich range of stories provided. 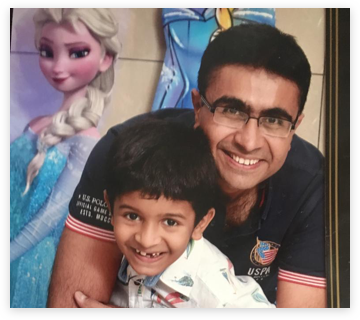 Father of 8 year old Dhruv. My son had lately reduced his reading activity since he’s been busy with various sport activities post school hours and to get him to read books was getting tough. Getlitt is helping him to go back to books and he’s slowly but surely enjoying the experience of reading books on the app especially the book dares concept is helping him to remember the story he’s read since it asks relevant questions which provide a good gist of the story. 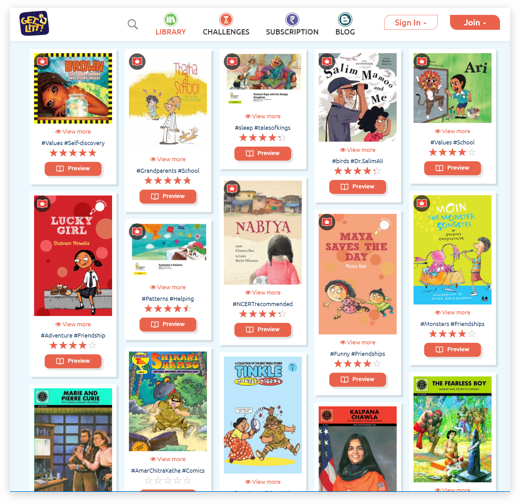 Getlit is an innovative way of getting today’s kids hooked onto reading. It’s game based scores make it challenging, competitive and fun for the kids. Most of us love Netflix. For a monthly fee, you can access hundreds of movies and serials anytime, without the hassle of recording or storing them. However, as a parent, you might be worried that your kid would spend all his free time watching movies. Well, there is perfect solution for that dilemma- give them access to an online library where they can access, choose and read amazing books. In other words, give them GetLitt! There are many reading devices and subscription services that allow people to access books and audiobooks and magazines- like Amazon Kindle, Kindle Fire, Kindle Unlimited, Scribd, and Google Play Books. However, none of them are oriented towards kids. There are comics publishers and websites like Marvel Comics and Comixology where you can access digital comics and graphic novels- but they largely cater to adolescents and adults. There are many places where you can get your teenager a book subscription, but very few options available for budding bookworms. GetLitt! is an app that features literature exclusively for children. You can download it on your tablet from Google Play store and iTunes. Once you take a subscription, your child can get unlimited access to hundreds of high quality books from reputed children’s publishers and authors. If you want your child to read more, or if your kid is already an avid reader, a GetLitt! subscription is the best gift you can give her. 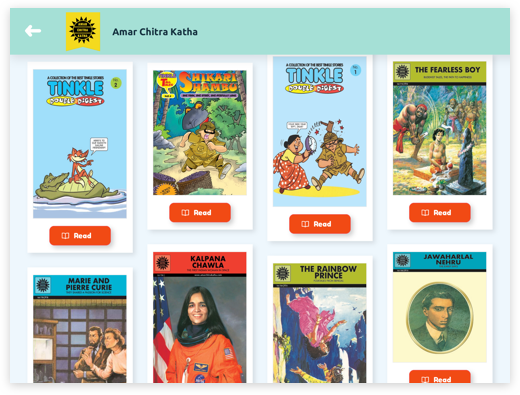 Our library has hundreds of books from reputed children’s publishers like Amar Chitra Katha, Tinkle, Duckbill, Young Zubaan, Tulika, Storyweaver, FunOkPlease, PickleYolk Books and Ms. Moochie. The books are of high quality, with bright pictures and rich colors, which are eye catching and engaging. The library also has chapter books and comics for the older children. Our collection has books of many genres, like comics, biography, adventure, wildlife, humour, science, mythology and mystery. 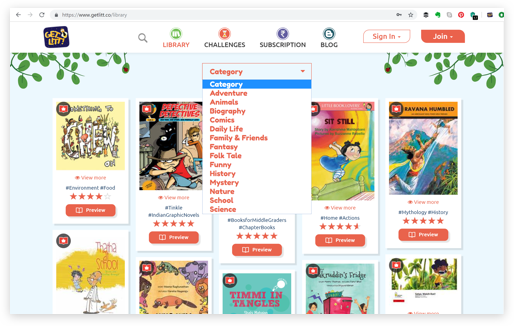 The books can be sorted by category and title, and the search process in simple. Our young readers can access the entire collection once they get a subscription. The more books they read, the more Jugnu they release and more Knowledge Manis they unearth. Their achievements and trophies get showcased on their page and on the leaderboard. Parents can keep track of their child’s reading progress by looking at their profiles. The children can also write reviews of the books they read. What’s more, they can also read interviews of their favorite authors and illustrators and understand the creative process better, and also know about upcoming and ongoing projects they are working on. The best thing about GetLitt! is that the library is updated regularly. There are many online libraries that offer many books, but most of them have a static collection. Even the ones that get updated often, update with older books whose copyrights have expired. At GetLitt!, you can access both old and new books that are of high quality. New books also explore contemporary issues and subjects in sensitive and identifiable ways. Most of us cannot afford to buy unlimited books, no matter how much we love them. On top of that, physically storing books becomes a problem at most homes- and no matter how much we love our collection, eventually a time comes when we have to give them away. Maintaining a library at home is also a time-taking task, as books require care. They have to be dusted regularly, checked for mold, and protected from dampness and insects. Despite our best efforts, books get damaged with time and pages become brittle with age. While there is no greater pleasure than to be surrounded by books at home, it is not possible for most of us, and hence, it is important to get access to a good library. Although every parent wants his or her kids to read more, locating a good library is a difficult task. Our lives are busy, and children now have very little free time or energy to take an extra trip to the library. Online reading apps are a good way to nurture the habit of reading in the digital age. All you need is a laptop or tablet and your child can read at any time and any place. When you get a GetLitt! subscription, your child can explore and read at his own time- all they need is an internet connection. Our lives are getting more integrated with technology, especially when it comes to accessing and consuming information. Digital reading is becoming the norm today, and parents are keen on their children reading more, on whichever medium. Reading together is also a great way to bond as a family, and with a GetLitt! subscription, you can do just that. When you get a reading subscription on GetLitt!, you no longer have to worry about storing or losing a book. Every book you read, you can revisit any time. Our library has a robust collection, and we make sure that we have something for everyone. Children are free to choose whatever they want to read, and the power of having that choice motivates them to read more. 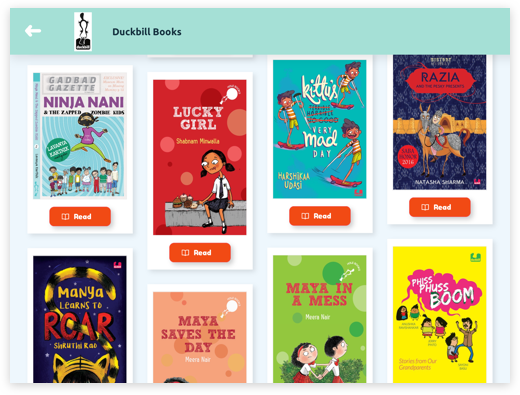 Our collection has books of varied categories and types so that our young readers can explore various types of writing and get a chance to experience all that the world of reading has to offer. GetLitt! gives you access to hundreds of books, and we are continuously adding new books to our library. GetLitt! wants every child to have access to books they like, and want children to experience all the joys that reading can bring. For every three subscriptions, we unlock a fourth subscription for a child who does not have any access to books. Whenever you get a subscription on GetLitt!, your child automatically becomes a part of the Reading Challenge for that time period. The more books she reads, the more Jugnu she releases, and higher her score gets. 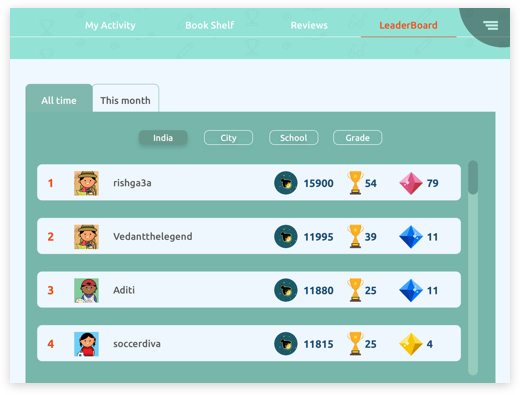 The young readers get special trophies and achievement badges based on their progress, and the same gets displayed on their leaderboard. It is a no-brainer that children take more interest in learning when it is fun, and the challenge motivates them to read more. At the end of the day, reading a good book is a reward in itself. Our library features many award winning children’s books like Bonkers by Natasha Sharma, Gone Grandmother by Chatura Rao, Kittu’s Very Mad Day by Harshikaa Udasi, Maharani the Cow illustrated by Nancy Raj, and Gajapati Kulapati by Ashok Rajagopalan.